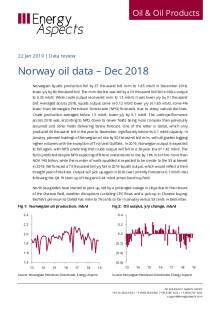 Norwegian liquids production fell by 27 thousand b/d m/m to 1.85 mb/d in December 2018, lower y/y by 80 thousand b/d. The m/m decline was led by a 33 thousand b/d fall in NGLs output to 0.32 mb/d. While crude output recovered m/m to 1.5 mb/d, it was lower y/y by 31 thousand b/d. Averaged across 2018, liquids output came in 0.12 mb/d lower y/y at 1.85 mb/d, some 4% lower than Norwegian Petroleum Directorate (NPD) forecasts, due to steep natural declines. Crude production averaged below 1.5 mb/d, lower y/y by 0.1 mb/d. The underperformance across 2018 was, according to NPD, down to newer fields being more complex than previously assumed and other fields delivering below forecast. One of the latter is Goliat, which only produced 64 thousand b/d in the year to November, significantly below its 0.1 mb/d capacity. In January, planned loadings of Norwegian oil rise by 50 thousand b/d m/m, with all grades logging higher volumes with the exception of Troll and Gullfaks. In 2019, Norwegian output is expected to fall again, with NPD predicting that crude output will fall to a 30-year low of 1.42 mb/d. The fall is predicted despite NPD expecting offshore investments to rise by 13% in 2019 to more than NOK 140 billion, while the number of wells spudded is expected to be similar to the 53 achieved in 2018. We forecast a 73 thousand b/d y/y fall in 2019 liquids output, which would reflect a third straight year of declines. Output will pick up again in 2020 (we currently forecast a 0.1 mb/d rise) following the Q4 19 start-up of the giant 0.44 mb/d Johan Sverdrup field. North Sea grades have started to perk up, led by a prolonged outage in Libya due to the closure of the Sharara field, weather disruptions curtailing CPC flows and a pick-up in Chinese buying. Ekofisk’s premium to Dated has risen to 76 cents so far in January versus 53 cents in December.